Oogave Cola. Where do I start? This...is an awful soda. Through and through. I couldn't find one redeeming quality beyond the labeling. I love the minimalist design. It's simple, effective and eye-catching. You've got your brand name, your ingredients list, your flavor, and the requisite color to coincide with the flavor. Opening the bottle, I took a whiff-sweetness. That was about it. Tasting it was something I would regret, and for some reason I continued to take sip after sip, even stomaching a mouthful, in a vain effort to convince myself it wasn't as bad as I thought. It never got any better, only much, much worse. What did it taste like you ask? Well, it sure as hell didn't taste like agave nectar(which has a sweet, burnt taste), and it certainly did not taste like cola(at least, nothing you should market). I can pinpoint exactly what it tasted like-it was like drinking sugar water that had been poured from the inside of a hot, inflatable pool toy. 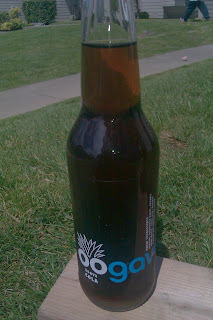 It was incredibly off-putting how much this soda tasted like cheap plastic/rubber. I also detected a little hint of something I had noticed myself in my first attempt-that strange chemically flavor that happened when I fermented my ingredients. I don't know what it is about colas, but it seems to be a recurring theme that one of the ingredients "spoils" in the fermentation process and turns the whole batch completely awful. Hell, it even happened when I was working with a cola-flavored extract. My guess would be that the lemon and/or lime juice "sour" the yeast...but that's a risk you take when you make a homemade cola(I've made a few successful batches of cola from extract). Difference is, there's a chemical reaction in the mix with a homemade soda-the yeast, heat, sugar, spices, yada yada yada. You don't have any of that coming into play with a store-bought soda. Store-bought sodas are mixed up and false-carbonated with co2, yeast isn't involved at all-so what gives? I don't know, and I don't really want to know. What I do know, is that I will never even look at an Oogave Cola bottle if I can help it. The memory of that awful taste would just drive me to madness. It was clean and effective. It looked like a cola, and I could clearly read the brand from across the store. Points for the company distributing in a glass bottle, although I can only imagine that a plastic bottle would merely enhance the awful flavor they were clearly shooting for. Did I mention the inflatable pool toy juice? Blech! Sweet, slightly burnt. Much like agave nectar(the sweetener used in the bottle), but lacking some of the quality, probably due to the dilution I'm sure. Very deceptive, actually made me think this wouldn't be so bad. Not only do I recommend not buying or consuming this swill, I actively discourage you from even mentioning it lest it fly into your unsuspecting taste receptacle and pollute your flavor receptors with it's ungodly plastic juice-ity.